I've been snapping pics of my standard size avatar and my petite self, so I decided to chunk the "biggie" and petite photos together in one post. Usually, I make a necklace then I make earrings to match, but this time around, all I could think about were earrings. So, I made this really cool pair of earrings--a hoop with little abalone beads attached with twisted wire, and a square stone dangling from the hoop. And, of course, a necklace followed. I'm calling this the Phaedra's Adornment Necklace & Earrings. They come in 3 texture changing sets and surely anyone would find a color set that pleases them. The stones include: Turquoise, Sugalite, Green Turquoise, Fire Agate (shown above), Chrysoprase, Chrysocolla, Rose Quartz, Yellow Sapphire, Amethyst, Rube (shown below on petite me), Blue Jasper, and Spiderweb Obsidian. Each set also includes 8 different Abalone choices for the beads. I love colorful gemstones! Here's petite me sporting a new outfit from Sister Fate--and it was a hunt gift for the Roses Are Red Hunt! This was a fantastic hunt gift, a re-colored version of one of their regular outfits, including the lovely top, leggings, and tiny shoes. And, I just had to throw in this photo of me and my friends to show you the wide variations in avatar size. I'm a fairly tall gal, but my friend Celeste (in the tiara) is a little package. Celette and Suzette are petites--now you can really see the contrast! It's a challenge making jewelry to fit them. Hey! Where's their jewelry?! lol. Jewelry: ELEMENTAL JEWELRY--Phaedra's Adornment Necklace & Earrings, Brights. PETITE ELEMENTAL JEWELRY--Phaedra's Adornment in Classics. Also in Pastels. Celeste's tiara is also from EJ. Here's a slurl to the mainshop: http://maps.secondlife.com/secondlife/bono/221/224/22. The petite shop is right next door. Hair: Diva Hair--Manon in citrine. Purchased full price. Eyes: Mayfly--Liquid Light Mesh Eyes, amber. Purchased on sale. Top: Mischief--Casual Cami in orange. A group gift many years ago. Mischief no longer exists. Pants: LeeZu--Yve Pants--hippie orange. Purchased full price. Shoes: G Field--Knot Wedge Sandas, copper. Purchased full price. 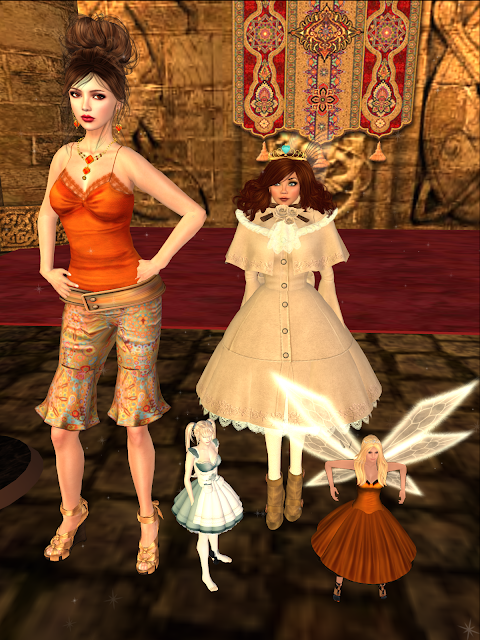 Red Petite Outfit: Sister Fate--Petites Veronica. From Roses Are Red Hunt. Sorry, I have no idea what my friends are wearing!